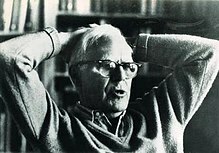 Martin Gardner (October 21, 1914–May 22, 2010) was an American writer. He had many interests, so he wrote about many topics. He wrote about mathematics, magic, literature, philosophy, skepticism, and religion. He wrote the "Mathematical Games" column in the Scientific American magazine from 1956 to 1981. After that, he wrote the "Notes of a Fringe Watcher" column in the Skeptical Inquirer magazine. He published over 70 books. Gardner also sometimes wrote under pen names. As "Uriah Fuller" he wrote Confessions of a Psychic. As "George Groth", he criticized his book, The Whys of a Philosophical Scrivener. 1957 The Wizard of Oz and Who He Was. (with Russel B. Nye) Michigan State University Press. Revised 1994. 1987 The Annotated Innocence of Father Brown Oxford University Press, ISBN 0-19-217748-6 (Notes by Gardner, on G. K. Chesterton’s stories). 1999 The Annotated Thursday: G. K. Chesterton's Masterpiece, the Man Who Was Thursday by G. K. Chesterton, Edited by Martin Gardner. Note: Gardner also wrote some books on magic for professional magicians. These books are not listed here. Martin Gardner's columns from Scientific American are printed in 15 books. Don Knuth calls these books "the Canon". ↑ 1.0 1.1 Martin, Douglas (May 23, 2010). "Martin Gardner, Puzzler and Polymath, Dies at 95". The New York Times. Retrieved May 24, 2010. ↑ "Martin Gardner dies at 95; prolific mathematics columnist for Scientific American - Los Angeles Times". Articles.latimes.com. 1914-10-21. Retrieved 2010-05-27. ↑ "CSI | Articles by Martin Gardner". Csicop.org. Retrieved 2010-06-22. ↑ Tierney, John (2009-10-20). "For Decades, Puzzling People With Mathematics". The New York Times. Retrieved 2010-05-12. ↑ "The Psychic Mafia - Part 6 of 6". Members.fortunecity.com. Retrieved 2010-06-22. ↑ More by George Groth (1983-12-08). "Gardner's Game with God | The New York Review of Books". Nybooks.com. Retrieved 2010-06-22. ↑ This book is a reprint of The Mathematical Gardner, published by Wadsworth. Mathematicians wrote this book to thank Gardner when he retired from writing his Scientific American column in 1981. Important mathematicians submitted papers for this book. This shows Gardner's importance. Martin, Douglas, “Martin Gardner, Puzzler and Polymath, Dies at 95” ; New York Times, May 23, 2010.